A rare opportunity to acquire a potentially rich rural holding conveniently situated 10 minutes from Gresford, 20 minutes from Singleton and only 2hrs from Sydney. 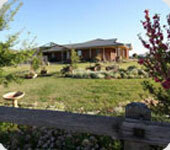 This property boasts approximately 385 Acres (155. Ha) of undulating to hilly grazing with sweeping elevated views and predominantly cleared with some timbered portions of country. Well watered with an average of 40" a year, spring fed gullies and a host of dams. Outstanding young Australian student from Cunnamulla in SW Queensland Wallace Dunsdon has been named as one of ten 2008 Charles Hawker Scholars. Hawker family member, Member for Wannon and former Speaker of the House of Representatives Hon David Hawker MP, presented the recipients, from five states, with their scholarship certificates at a series of commemorative functions on Saturday 23rd and Sunday 24th of August at Bungaree Station in South Australia. Dr Brian Heim follows his win as Australia's top agriculture teacher for 2008 by taking the title of `Australia's Trade and Skills Teacher of the Year´ — having held out 14 finalists from eight industry categories — under the Institute for Trade Skills Excellence (ITSE) Australian Training Awards, presented during a gala ceremony at the Darwin Convention Centre. 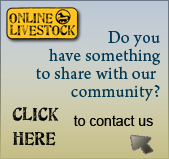 If you would like to advertise with Online Livestock via Newsletters or the www.onlinelivestock.com.au website please contact us here. The WAQHA had another successful two day AA show held at the State Equestrian Centre, Brigadoon on October 25th and 26th which saw a good number of competitors back in the show ring. The weather was a little unpredictable, for those who camped on Friday night would have experienced the storm, Saturday morning it rained non-stop, but by Saturday afternoon and Sunday it was beautiful and sunny. The Australian Quarter Horse Association - was incorporated in 1972 and over the years has expanded to serve a rapidly growing and diverse industry. In addition to preserving the breed through registration guidelines and record keeping, the AQHA is also dedicated to serving each of its Members. So with approximately 7,000 new registrations every year, AQHA's role continues to expand.